With studio space in New York and a home base in Australia, Maryanne Moodie has quickly become a household name among weaving enthusiasts around the globe. But many may be surprised to realize that the Australian artist who recently published On The Loom: A Modern Weaver’s Guide ($27.50, 144 pages) stumbled across her first loom only about five years ago. 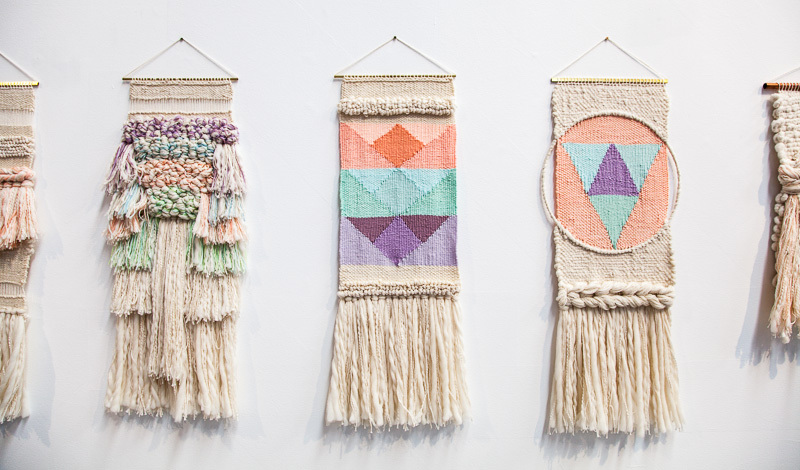 Undeterred, Moodie grabbed the jute and neon wax cord she had on hand and dove into her first weaving project. 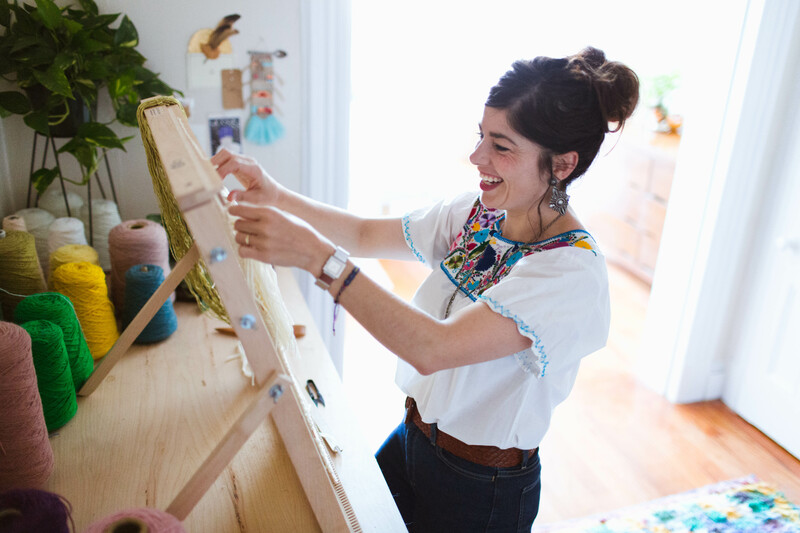 Read the rest of the story I wrote about Maryanne and her handmade business in the Craft Industry Alliance Journal and listen to my conversation with her below. You can find out more about Maryanne’s book, tapestries, online tutorials and weaving kits here. Artist Inspiration: Check out the work of L.A.-based artist Tanya Aguiñiga, a creative force who has inspired Maryanne. Let’s Weave Together! Michigan listeners are invited to come to the first CraftSanity workshop on my new Kindred Loom Collection on April 1. The workshop is open to weavers of all experience levels and the cost is $40. Supplies will be provided along with looms to use during the class that will cover hat, headband and mini-cowl weaving techniques. Space is limited is this introductory workshop that will cover the continuous weaving technique I use to weave hats, headbands, cowls, blankets and rugs. Reserve your spot in the workshop below. Questions? Email me. * Note: A CraftSanity Loom discount will be offered to attendees who place loom orders the day of the workshop. Thymopolypeptides solution take fresh cow thymus as raw material.Producted by several technics such as repeated freeze-thaw, extraction, ultrafiltration. I’ve been exploring for a little for any high quality articles or weblog posts in this sort of house . Exploring in Yahoo I ultimately stumbled upon this website. Reading this info So i’m satisfied to express that I’ve an incredibly excellent uncanny feeling I found out just what I needed. I most without a doubt will make sure to don’t disregard this website and provides it a glance regularly. Along with almost everything that seems to be building within this particular subject material, a significant percentage of opinions happen to be relatively refreshing. However, I beg your pardon, but I do not subscribe to your entire plan, all be it exhilarating none the less. It seems to us that your opinions are generally not totally justified and in fact you are your self not even totally convinced of the assertion. In any case I did enjoy reading it.